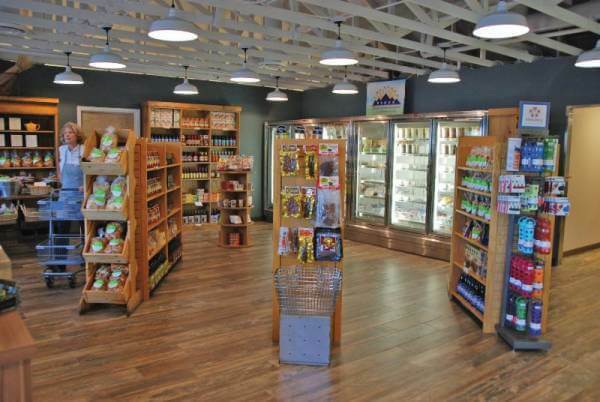 Garden of the Gods Gourmet has taken a big step with their move to a much larger space along Highway 24 at 26th Street in Old Colorado City. Another upgrade: Callicrate Beef burgers, Bristol Beer brats and organic Sno-Pack frozen vegetables with potentially more Ranch Foods Direct-sourced items to come. In addition to a much roomier breakfast and lunch space, there’s a takeout deli, bake shoppe, and coffee, juice and smoothie bar. The adjacent market still offers the ever-popular prepared soups and frozen meals but now also boasts meat, eggs and cheeses, even in-house floral arrangements. A wine bar is also planned. The decor inside includes many impressive details like the use of reclaimed wood for floorings and paneling, a two-sided fireplace that divides the dining room from a more casual grab-and-go bar area and displays of colorful local artwork. The place was buzzing on a recent afternoon, while the crispy efficient staff was all smiles, clearly pleased to be working in such a classy, well-designed atmosphere. “It’s thrilling to be a part of this,” Karrie said.